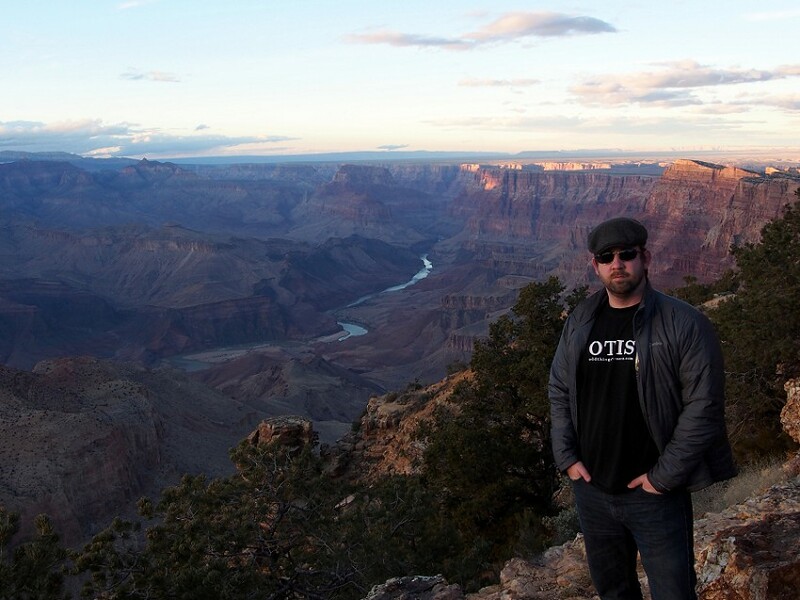 March 29, 2015 — So I wasn’t completely forthright about my first impression of the Grand Canyon. Everything I wrote about it was true, but I left out one detail: The morbid bit. I thought about skipping it entirely in light of the Germanwings crash, but it’s kind of now or never with this one for me. As I mentioned, my first view of the Grand Canyon was at the Desert View lookout point, near the east entrance of the southern rim. 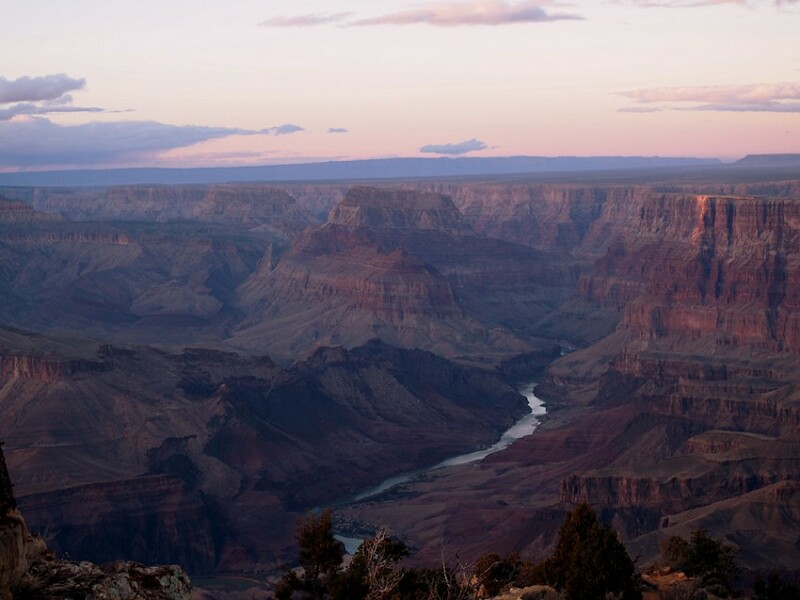 The lookout’s most prominent feature—besides the 18-mile-wide crevasse it overlooks—is the 80-year-old, 70-foot-tall Desert View Watch Tower. The lookout’s least prominent feature is a placard attached to the guardrail below the tower. I assumed the placard was about rock strata or river erosion or some such science. I went over to take a photo to read it later, as I often do. Instead, I discovered a terrible few paragraphs that changed how I was viewing that awe-inspiring landscape. On June 30 1956, two planes, a TWA Lockheed Super Constellation and a United Airlines Douglas DC-7 on transcontinental flights—both having left Los Angeles International Airport mere minutes apart—collided right there, 21,000 feet above the Grand Canyon, killing all 128 passengers and crew. At the time, it was the worst commercial air disaster in the United States. Back then, pilots were on their own when navigating the skies, and the general theory is that both planes were either trying to avoid the same clouds or were giving their passengers a better view of the Canyon. Within a year or two, the FAA was instituted, as were various safety procedures, mostly because of this collision. The placard labeled the two buttes, Temple and Chuar, over which the debris and death were spread. Actually, still is spread to some extent, as not every piece of wreckage or personal artifact was removed. Last year, the site was dubbed a National Historic Landmark, and the isolated area further protected from anyone visiting it. Now, I’ve been to my share of elaborate flight crash memorials thanks to The New York Grimpendium, but something was different about this simple placard. I mean, before I’d read it, I’d been gazing at the spot with my jaw dangling trying to take in its vastness and beauty. Now, my open-mouthed fascination was out of horror and sadness. It really stuck with me. just below the horizon and the one in front running perpendicular to it. 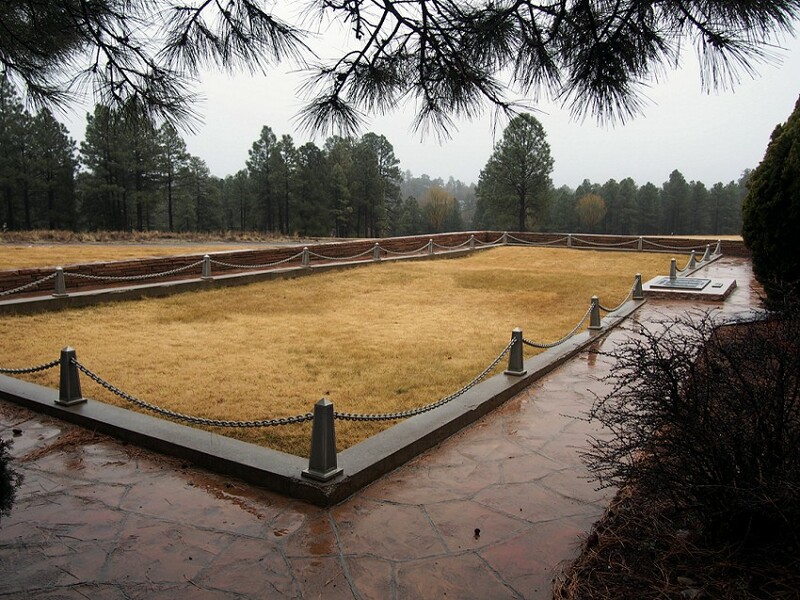 That’s why, three days later, when we found ourselves in Flagstaff, I detoured us to Citizens Cemetery, near Northern Arizona University. 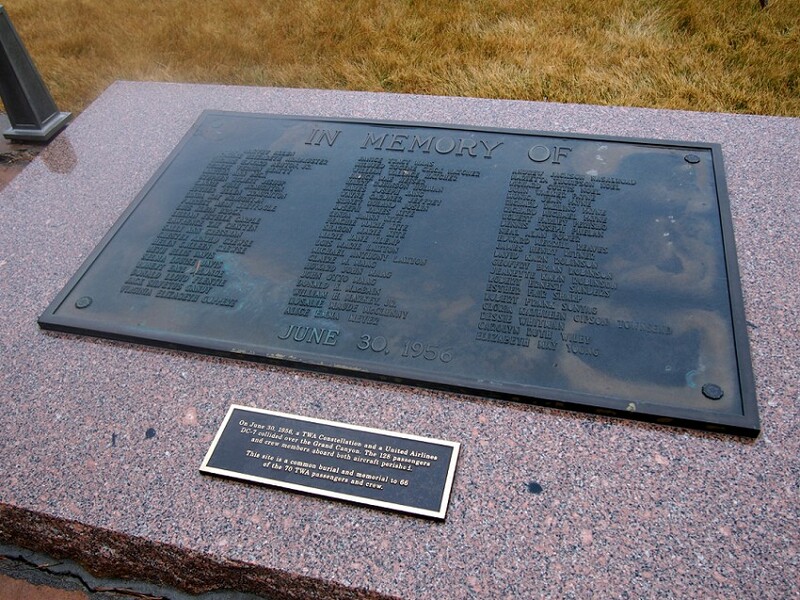 There, we found the mass grave of 66 of the 70 crash victims from the TWA plane. 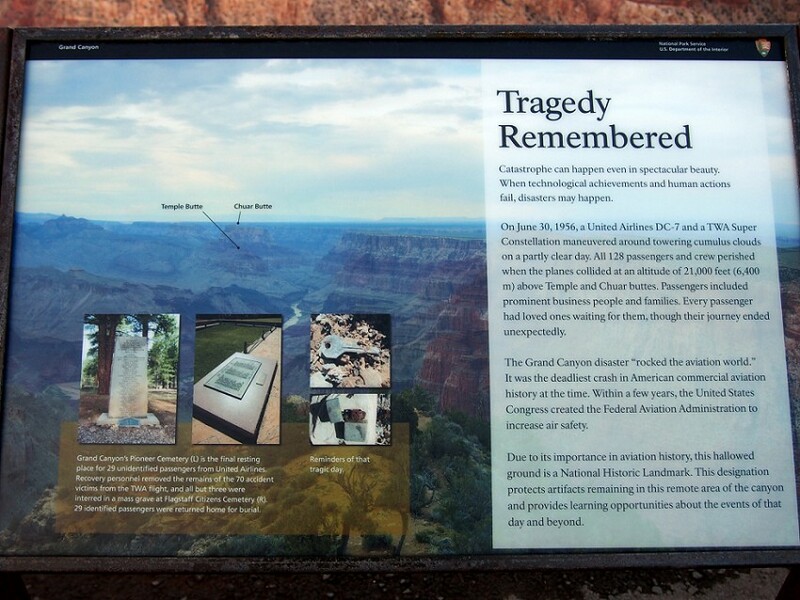 Most of the dead from the United Airlines plane were interred at the Grand Canyon’s Pioneer Cemetery, which I didn’t seek out while we were at the canyon. I don’t know why. I probably didn’t think I’d still be thinking about it three days later. The spot at Citizens Cemetery was a large rectangular grassy space outlined in cement and low chains. A pair of plaques listed the names and explained the existence of the oversized burial plot. It was a quick stop on a rainy morning, soon to be pushed out of my head with all the adventuring we would be doing later that day. Still, it’s one of the things I now think about anytime I hear about the Grand Canyon. Grand Canyon death is actually a pretty captivating topic. The Wikipedia article for the natural wonder even features a section dedicated to it. Apparently, there have been 600 deaths recorded at the national park, very few of which are people falling over the edge and 23 of which include outright murder. But by far the largest percentage of that number were those 128 lives lost in 1956, 128 people who technically weren’t even visiting the place.